Whenever I see a book about Jane Austen, I always jump at the chance of reading it, even though I read everything I can about her. She is such a popular author but there is not much about her out there, so I am always intrigued when I get to read another person’s opinion about Austen. So when I saw this book, I jumped at the chance to read this one. This book is cataloged as a biography for teens and the author’s other works is also targeted towards teen readers. That being said, this short biography is perfect for readers, young and old alike, who are first being introduced to Jane Austen want to know more about her. 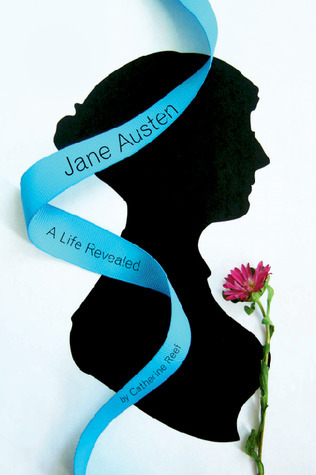 This is not the book for those who are avid readers of Austen’s work, know enough about her but want to learn more. The language is very simplistic, which is understandable since the book is directed towards young readers. It was great that she gave a summary of all Austen’s six novels. However, I wished Reef did not give a complete synopsis, beginning and end. The point is to get young readers to become interested in Austen’s novels. If you give them the entire story, they will feel that should not have to bother in reading the book for themselves. Reef should have given a little taste and leave her readers wanting more. However, Reef did a great job giving a glimpse of the history of Georgian England. She did not make the language complicated when she was talking about 18th century England. Reef made and interesting and gave the opportunity for young readers to do more research of their own. Overall, this was a decent and short biography of Jane Austen. If you plan on introdcuing someone, whether it is a teenager or an adult reading Jane Austen for the first time, this biography is a perfect introductory book to recommend to them. However, if you are Jane Austen enthusiast, they are great Jane Austen biographies out there but this one would not be for you. You will feel that you are in need of something more and will be seriously disappointed.